The caption for this photo I found on Flickr says this is the only Edward VIII pillar box in Exeter. Another photo says it is the only one in Devon. The box is just down the road from me in an estate built in 1936 to rehouse people from the Exeter slums. Edward VIII’s short reign – he came to the throne in January 1936 and abdicated in December 1936 – means that not many EVIIIR post boxes were made. (There are even fewer EVR boxes.) So far, so quite interesting. But look up post boxes on the internet, and you stumble into a strange and fascinating place. 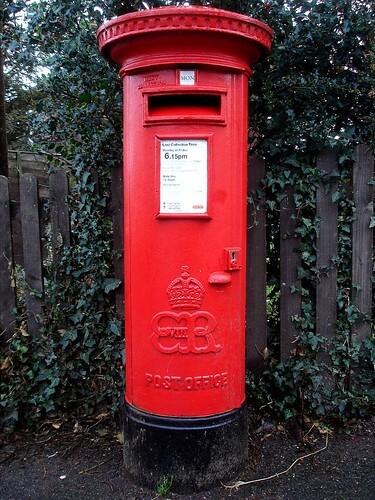 There are websites dedicated to finding and photographing all the EVIIIR post boxes in the country. There is the Letter Box Study Group, the “the recognised definitive authority on the British letter box”, and its “Letter Box Study Group newsletter”, no better fodder for Have I Got News For You. It is the weird and wonderful world of the Great British Enthusiast, a place where interesting things in unlikely places become codified, classified, and nerdified. Abandon all hope, ye who enter here, for ye are passing through the gate of Hell where the interesting-ness of any subject is electronically extracted and transmogrified into tables of data and forum discussions! On the other hand, without the dedication of this nerdy few, who have counted EVIIIR boxes and noted their distribution and rarity, how would the many know that there might be something of quite interesting-ness at all? Amusingly, when I posted about the box on Facebook, both of the responses I received were by private message rather than public comment, as though ashamed of their, or their friend’s, interest. So for any secret spotters out there, the pillar box code number is EX2 369, and the map shows its approximate location.